It’s a sea of green in equity markets from Asia to Europe, with U.S. futures sharply higher following late Monday news of a tentative deal among American lawmakers to avert another government shutdown, while optimism about US-China trade talks rose after administration officials hinted at a meeting between Trump and Chinese President Xi “soon”. Meanwhile, President Trump said “we are going to make great deals on trade” and don’t want China to have a hard time. President Trump also commented that we probably have some good news regarding border deal but added he didn’t know what they meant regarding progress and affirmed the US would build the wall anyway. All this was taken quite well by traders, and Tokyo’s Nikkei set the tone with its best day of the year so far, surging 2.6% as the yen tumbled to 2018 lows, while Europe wasted little time in trying to lift the STOXX 600 back to the two-month high it set last week, led by carmakers. Germany’s DAX jumped more than 1.2% after rising 1% on Monday, and Paris and Milan were up 0.8%, while London’s FTSE approached a four-month peak despite ongoing Brexit uncertainty. Earlier in Asia, MSCI’s broadest index of Asia-Pacific shares outside Japan edged up 0.3%. Shanghai rose 0.7% South Korea’s KOSPI climbed 0.5 percent and Australian shares gained 0.3 percent. The Nikkei rallied though, shooting up 2.6% after closing on Friday at its lowest level since early January after a market holiday on Monday. With the yen sliding again, shares of exporters such as automakers and machinery makers led the charge. Separately, Deutsche Bank noted it was 20 years since Japan cut interest rates to zero, something now standard in large parts of Europe. Japan’s 10-year bond yields remained in negative territory even after the central bank cut purchases of some longer-dated bonds for the first time since July in a regular operation. The BOJ has sought to taper its purchases while focusing on yield targets rather than quantitative easing. Nissan reported worse-than-expected results. The dollar hovered at a two-month high and was fractionally higher on the day, its 9th consecutive daily increase, and the Australian dollar also gained (more below). The yen and Swiss franc dipped while U.S. Treasury and German bund yields edged up as investors jettisoned safe havens after U.S. lawmakers said they reached an “agreement in principle” on border security funding that would avert a second government shutdown. The Trump administration said the president still wants to meet China’s Xi Jinping in an effort to end the trade war. According to Juckes there was now a 75% chance that a hike of U.S. tariffs on Chinese goods at the start of March will be avoided and a 95% chance that another U.S. government shutdown will be dodged. Those odds were boosted late on Monday when as we reported U.S. lawmakers reached a tentative deal on border security funding, though aides cautioned that it did not contain the $5.7 billion President Donald Trump wants to build a wall on the Mexican border, and the president has yet to opine on whether the deal is agreeable. The developments were good enough for S&P 500 e-mini futures to rise 0.7%, however, pointing to a solid start on Wall Street later after a choppy day on Monday. Meanwhile, U.S. and Chinese officials expressed hopes the new round of talks, which began in Beijing on Monday, would bring them closer to easing their months-long trade war which would see the tariffs on $200 BN worth of Chinese goods rise from 10% to 25%. “There will be no winner in a trade war. So at some point they will likely strike a deal,” said Mutsumi Kagawa, chief global strategist at Rakuten Securities in Tokyo. In fx, the dollar was mixed but held on to recent gains, having risen for eight straight sessions against a basket of six major currencies until Monday, its longest rally in two years. Although the Fed’s dovish turn dented the dollar earlier this month, analysts – who were generally expecting a slump in the dollar only to be wrongfooted once again – noted the U.S. currency still has the highest yield among major peers and that the Fed continues to shrink its balance sheet. Elsewhere, the Swiss franc was the worst performer; the yen fell to the lowest this year and Treasuries declined across the curve in the wake of the tentative deal on border security funding; the news that President Trump still wants to meet China’s Xi Jinping to help end the trade war also added to the moves. The euro dropped as much as 0.2% to 1.1258, a three-month low, before erasing losses; offers extend to 1.1350 and are part of fresh short interest, according to traders. The Swedish krona led Group- of-10 gains while the Norwegian krone and the Canadian dollar got some tailwind from rising oil prices. Elsewhere, Brent crude rose after its lowest close in more than a week. Emerging markets shares climbed and their currencies edged higher. The pound held steady as U.K. Prime Minister Theresa May prepared to update lawmakers on the progress — or lack thereof — of Brexit talks with the EU. The offshore yuan strengthened for the first time in five days. Asian equity markets traded mostly higher amid growing optimism regarding US-China trade talks and hopes of averting a government shutdown, as negotiators were said to have reached an agreement in principle in which the border bill will include some funds for a barrier. ASX 200 (+0.3%) and Nikkei 225 (+2.6%) were positive with outperformance in the Japanese benchmark on return from the extended weekend as exporters were underpinned by favourable currency moves, although Toshiba was the notable laggard after it confirmed reports it could reduce FY profit guidance by half. Elsewhere, Shanghai Comp. (+0.7%) and Hang Seng (Unch.) were kept afloat but with upside limited by indecision as participants await the outcome of trade discussions and after the PBoC refrained from open market operations which resulted to a daily net drain of CNY 100bln. Finally, 10yr JGBs were lower amid outperformance of Tokyo stock markets and following a reduction of the BoJ’s Rinban amounts in which it lowered its purchases of 10yr-25yr JGBs by JPY 20bln. PBoC skipped open market operations for a net daily drain of CNY 100bln. All major European indices are in the green [Euro Stoxx 50 +1.0%], continuing from the optimism seen in Asia overnight on US-China trade and the potential for averting a US government shutdown. Sectors are also all in the green, with some slight outperformance in material names. The Dax (+1.2%) is marginally outperforming its peers, in spite of being weighed upon by index heavyweight Thyssenkrupp (-1.9%) who are down following earnings where the Co. confirmed their outlook, but stated that economic and political uncertainties are increasing. Other notable movers include, Michelin (+11.6%) who are at the top of the Stoxx 600 following their earnings, with Continental (+4.1%) higher in sympathy. Towards the bottom of the Stoxx 600 are Tui (-3.1%) following their earnings. Separately, Kering (+2.4%) were in the red following their earnings, in spite of Gucci’s operating margin reaching a record 39.5% by end of 2018; although Co. shares have now drifted higher into positive territory. In FX, the dollar remains bid in wake of reports that a deal has been struck in principle to avoid another US Government shutdown ahead of Friday’s funding deadline, while the US trade envoy has arrived in Beijing amidst heightened prospects of forging an agreement in time for the next tranche of import tariffs due on March 1st. The index just off a marginal new multi-week peak of 97.209, with the Dollar extending gains vs most G10 rivals. CHF/JPY – Another broad upturn in risk appetite has hit the safe havens hardest, understandably, with the Franc slipping closer towards yesterday’s overnight flash crash lows at 1.0091 vs 1.0095, and Usd/Jpy climbing to fresh 2019 highs circa 110.65 having breached 110.50 and the peak from 31st December last year just a pip or so below. Rebounding US Treasury yields are also impacting, and with no Japanese exporter supply anticipated before 111.00 where barrier defence offers are also expected, technical impulses could be more influential in the short term given a key Fib level and the 55 DMA in close proximity (110.54 and 110.59 respectively). NZD/GBP/EUR – Also conceding further ground to the Usd, with the Kiwi retesting support around the 100 DMA (0.6725) ahead of Wednesday’s RBNZ policy meeting that is widely forecast to culminate in a dovish hold (see our headline feed and/or research suite for a full preview of the event. Meanwhile, the Pound remains blighted by Brexit risk and related economic repercussions, as Cable teeters just above 1.2800 and a slightly deeper post-UK data low around 1.2834, with bids seen at 1.2820 and the 55 DMA at 1.2810. The single currency is consolidating off a fresh ytd base of 1.1258, but looking more prone to heavier losses while under 1.1300 and given little in the way of chart support ahead of the 2018 low (1.1216) apart from 1.1234. AUD/CAD – Defying the overall trend and both firmer vs their US counterpart, the Aud has rebounded firmly above 0.7050 and 1.0500 vs the Nzd with the aid of a more encouraging NAB business survey vs much weaker than forecast housing loans data. Meanwhile, the Loonie has drawn support from a rebound in crude prices and pared losses from 1.3300+ to circa 1.3270. EM – Some respite for regional currencies against the backdrop of improved risk sentiment, and with the Rand also relieved to hear that Eskom is hoping to end power cuts by the end of the week – Usd/Zar back down below 13.8000. In commodities, Brent (+1.7%) and WTI (+1.5%) prices are comfortably in the green and above USD 62/bbl and USD 53/bbl respectively after Saudi Arabia posited that crude production in March is set to be 500k below their OPEC+ cut target at 9.8mln BPD. Support has also been offered by the optimistic risk tone after positive comments pertaining to US-China trade and a deal to prevent the US Government from shutting down again; as USTR Lighthizer arrived in Beijing this morning. OPEC are to publish their monthly oil market report today, where 2019 world oil demand was forecast to grow at 1.29mln BPD. In addition, the EIA are to release their Short-Term Energy Outlook; which previously forecast US oil output to average 12.1mln BBL and 12.9mln BBL in 2019 and 2020 respectively. Gold (+0.4%) has strengthened somewhat this morning, breaking from the subdued price action seen overnight as the dollar remained firm; the yellow metal is now trading towards the top of its USD 10/oz range. Elsewhere, reports indicate that Vale knew the Brazil dam which collapsed last month was more than twice as likely to fail than the maximum allowed risk level from internal guidelines. Looking at the day ahead, there are no releases of note in Europe this morning while the only data due in the US is the January NFIB small business optimism reading and December JOLTS survey. Revisions to the PPI data will also likely warrant attention. Away from all that it is a busier day for central bank speak with the ECB’s Lane, Weidmann and Nowotny all speaking at separate events this morning. The BoE’s Carney is then speaking shortly after lunchtime in London at an event on the global economy and risks to the outlook. Later this evening the Fed’s Powell is due to speak at 5.45pm GMT albeit about economic development and rural poverty, so an unlikely venue for monetary policy guidance. The Fed’s Mester does however speak on the topic of the economic outlook and monetary policy at 11.30pm GMT while the ECB’s Lautenschlaeger speaks at the same time, albeit at a different event. Away from that Euro Area finance ministers are due to gather in Brussels and the monthly OPEC report is due. It might go under the radar but today is a bit of a landmark anniversary of sorts for financial markets. It’s the 20-year anniversary of the Bank of Japan cutting rates to 0% and the start of two decades of extreme monetary policy which the country has never been able to sustainably lift out from. A sobering template for Europe to worry about. Japan also kick started what became a more mainstream form of monetary policy post the GFC around the world. For economic historians Japan is really a fascinating case. If you took a snapshot of the nation’s finances and demographics today with no previous knowledge of the country’s journey over the last 30 years since its asset bubble burst, you would wonder how the country isn’t in a constant crisis. Debt to GDP is the highest in the developed world at 236%. The BoJ holds around 43% of all JGBs. Core prices in Japan are also virtually identical to where they were 20 years ago and 10yr JGBs have fallen from 2.21% to -0.03% over this period. Nevertheless, Japan is an example of how long a crisis can be averted for under extreme measures. It also highlights how perceptions can be turned on their heads. Yesterday we found this quote from The Economist 20-years ago: “Without fiscal discipline, say Bank of Japan officials, the government risks losing control of public spending, inviting hyperinflation in the world’s second-biggest economy.” So, an unhappy anniversary today in many respects but it’s also noticeable that after 20 years of high fiscal spending the Japanese don’t have populism. Maybe that’s a message for Europe. To the present where the last 24 hours hasn’t been anywhere near as exciting as the BoJ that historic day 20 years ago. Case in point, the intraday range on the S&P 500 yesterday for example was just 0.53%, the third smallest of the year, and trading volumes were 20% below their 100-day average. The good news is that there are a number of potential catalysts to make things more interesting bubbling away in the background, however just not quite in danger of spilling over right now. That of course includes the US-China trade meetings this week, another Brexit session in Parliament, and some potentially significant data which really kick starts from tomorrow with US CPI. Anyway back to markets where the S&P 500 closed a fairly uninspiring +0.07% yesterday. The NASDAQ (+0.13%) was a touch stronger if you’re looking for a shining light while the DOW (-0.21%) lagged behind. It wasn’t a lot more interesting in Europe prior to this where the STOXX 600 may have closed +0.85% but the reality was that it was just catching up to the late Friday rally on Wall Street last week. High yield credit wasn’t all that different where spreads in the US finished -2bps tighter while in bond land, Bund yields backed up +3.3bps to close at 0.117% – and therefore partially undoing some of last week’s rally which saw Bunds fall to as low as 0.076% at one stage and the lowest since October 2016. Treasuries (+1.9bps) were similarly weak (and are up another +2.7bps overnight – more on that below) while the curve – which has remained firmly rooted in a 14-20bps range all year – was flat at 16.6bps. Meanwhile, in oil markets both WTI (-0.59%) and Brent (-0.95%) sold-off after Reuters reported that a draft document for a OPEC and non-OPEC cooperation charter avoided any mention of prices, market share and production cuts.The document also suggested that OPEC and Russia will discuss creating a mechanism (i.e. no formal body) rather than an organization when they meet in April. Not helping oil was the stronger Greenback with the Dollar index rallying another +0.43%. That means the Dollar has now strengthened for 8 consecutive sessions which is the longest run since February 2017. In terms of actual news flow yesterday, the latest on the standoff in Washington is that a tentative deal has been reached by congressional negotiators, albeit for far less funding than Trump had sought and without confirmation from Trump yet that he will support it. Bloomberg reported that the lawmakers have agreed on all seven bills with the plan including $1.375bn for new border fencing. That compares to $5.7bn that Trump had wanted. Trump later commented at a political rally that “just so you know, we’re building the wall anyway”. 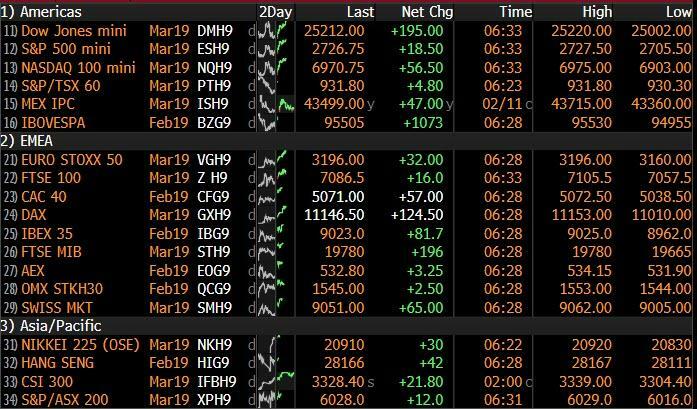 Nevertheless, the tentative agreement has lifted markets overnight with the Hang Seng (+0.16%), Shanghai Comp (+0.72%) and Kospi (+0.55%) all higher while the Nikkei (+2.64%) has really taken off after markets re-opened and post a couple of weak days for the Yen. The CNY (+0.07%) is stable following the big slide yesterday while S&P 500 futures are up +0.51%. 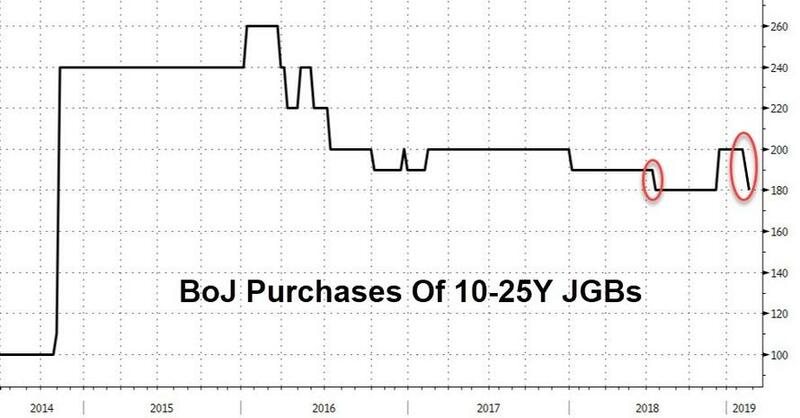 In other news, the BoJ trimmed its purchases of JGBs in the 10-25y bucket to JPY180 bn (vs. JPY200 bn previously) at today’s regular operation. They did a similar thing in July and the move comes after yields on super-long bonds fell to lowest since late 2016 on Friday. Meanwhile there’s really nothing material to report from the US-China trade talks so far with meetings continuing overnight in Beijing. At the margin the tone remains positive though with White House adviser Kellyanne Conway saying yesterday that “President Trump wants to meet with President Xi very soon” and that “this President wants a deal”. On a related note, it was interesting to read that the Commerce Department is likely to release a final report over the coming days (on the investigation under Section 232) which declares that imported vehicles and auto parts are a threat to national security. Tariffs are said to be an option for the President to consider under the investigation, and there will be a 90 day window for him to decide whether and how to implement them. One to watch. In Europe, Germany’s SPD party approved pension and labour law reform proposals, which would boost social spending. The proposals included an extension to unemployment benefits, a higher minimum wage, and enhanced pensions. The plan will not be implemented in the current coalition, but it could function as part of an electoral platform if the SPD decides to abandon the government and push for new elections after its planned review later this year. Over at the ECB, Ireland’s Philip Lane was officially nominated to be the ECB’s next Chief Economist which was as expected. In other news, there was some brief volatility in Spanish assets yesterday however it turned out to be more noise than substance. 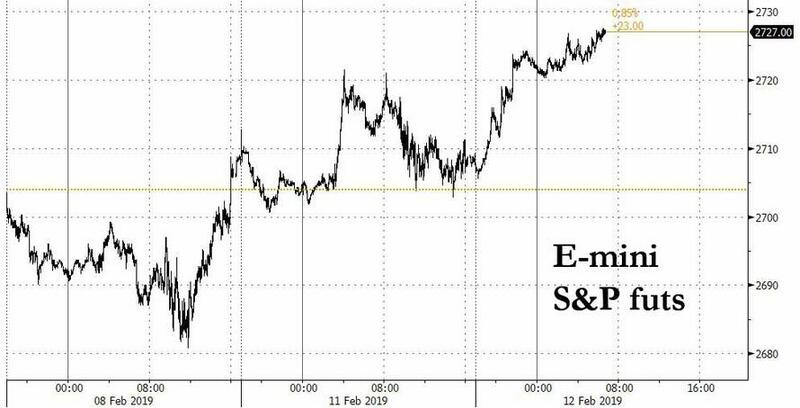 The IBEX sold-off as much as 0.80% from the highs and 10y Spanish Bonds were nearly 4bps off the lows at one stage after Efe news agency reported that PM Sanchez was considering calling snap elections for April 14th. The story was later rebuffed and Spanish assets quickly reversed the moves however this does come in a week when the government needs to get its budget passed when it goes to a vote in parliament tomorrow and the trial of the Catalan separatists who led the 2017 push for independence begins today. Spanish bond yields closed +0.7bps higher yesterday and the IBEX +0.90%. Elsewhere, there wasn’t much in the way of new Brexit news yesterday – aside from comments from Barnier which didn’t offer anything that we didn’t already know – however we did get confirmation that PM May will present a “neutral” motion to parliament today, having previously been scheduled for tomorrow.It’s expected that May will be asking for more time over negotiations with the EU. The suggestion is that she will offer parliament the right to vote on other Brexit options by the end of February but will not commit to bringing her deal back before then. Labour in return is expected to push for an amendment that requires any final vote on the deal by February. The vote on May’s motion and any amendments will likely be on Thursday. Staying with the UK, yesterday’s preliminary Q4 GDP print was even more disappointing than feared, coming in at just +0.2% qoq (vs. +0.3% expected). That means the annual rate has now fallen two-tenths to +1.3% yoy and so matching the six-year lows of Q1 last year. The December monthly reading actually dropped -0.4% mom compared to expectations for no change. It’s worth noting that the breakdown of the Q4 reading revealed that business investment contracted again, and therefore meaning it has contracted for a fourth consecutive quarter – the longest since the financial crisis. Sterling closed -0.69% yesterday, albeit wasn’t the worst performing G10 currency which went to the Norwegian Krone (-0.91%), as it sold off in tandem with oil. There wasn’t any data out in the US yesterday however we did receive the CPI revisions. Importantly though there was no change to core CPI on a year-on-year basis at 2.21%.Our US economists did however make the point that the January 2018 reading was downgraded from 0.35% mom to 0.30%. Importantly this makes for easier base effects and a lower hurdle for keeping the annual rate near recent levels. A reminder that we get the January CPI report in the US tomorrow. Finally to the day ahead,which is incredibly sparse for data. Indeed there are no releases of note in Europe this morning while the only data due in the US is the January NFIB small business optimism reading and December JOLTS survey. Revisions to the PPI data will also likely warrant attention. Away from all that it is a busier day for central bank speak with the ECB’s Lane, Weidmann and Nowotny all speaking at separate events this morning. The BoE’s Carney is then speaking shortly after lunchtime in London at an event on the global economy and risks to the outlook. Later this evening the Fed’s Powell is due to speak at 5.45pm GMT albeit about economic development and rural poverty, so an unlikely venue for monetary policy guidance. The Fed’s Mester does however speak on the topic of the economic outlook and monetary policy at 11.30pm GMT while the ECB’s Lautenschlaeger speaks at the same time, albeit at a different event. Away from that Euro Area finance ministers are due to gather in Brussels and the monthly OPEC report is due.